The global financial crisis reared its ugly head and sent global economic growth and world stock markets including India into a tailspin. Suddenly there was nervousness all around. Forget bad stocks with bad fundamentals, retail investors in India were loathe to put in their money even in good companies available at attractive prices fearing that prices will fall down further. Then 2013 dawned, signs of recovery began to be noticeable and stock markets surged once again. And with stable government in place the rally started with multi year bull run, major indices Sensex and Nifty continue to make new life time highs this year. Before the demonetisation event, India was on the track of recovery with factors like normal monsoon, seventh pay commission, public infrastructure investments and low crude oil price favouring it. However post demonetisation and later with implementation of GST last year, we have seen sluggish growth till Sept'17 quarter followed by significant earning growth in Dec'17 quarter. But off lately, the negative sentiments towards small and mid cap companies took over the rally witnessed over last couple of years. Change in sentiments towards small and mid caps due to various factors like change in portfolio allocation by Mutual Funds to comply with SEBI norms, implementation of Additional Surveillance Measures by SEBI, resignation of auditors of various mid size companies due to fear of being pulled up by SEBI, RBI, MCA have triggered major sell off in small and mid caps since beginning of this year. Even today when major indices Sensex and Nifty are at all time high, BSE Small Cap Index and Mid Cap Index is down by 16% and 11.2% respectively from their high made in January this year. Broader markets have witnessed such a severe correction in small and mid caps for the first time with most of small and mid caps companies share prices falling between 30% to 80% during last 6 months. Does it mean the mid and small cap investing story is over? Absolutely Not! The fall in stock prices of small and mid caps witnessed in 2018 must be considered as investment opportunity as valuations of many companies which were looking expensive by end of 2017 turned reasonable to attractive post recent correction. However, it's important to invest only in good companies backed by strong fundamentals now available at reasonable to attractive valuations. We believe its good time for long term investors to accumulate stocks of small and mid size companies available at significantly discounted prices. Implementation of various reforms by the government over last 2 years will help Indian economy to grow at a faster pace in coming years. 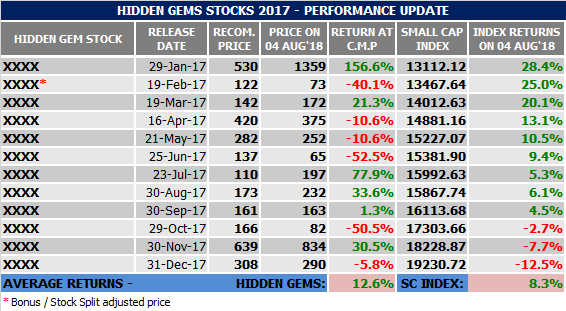 We are pleased to share that Hidden Gems (Unexplored Multibagger Small Cap Stocks) and Value Picks (Mid Caps with Plenty of Upside Potential) recommended by our equity analysts in 2017 have outperformed small and mid cap index by wide percentage points ensuring better returns for our members even during tough times. As illustrated in the table above, average returns (as on date) of Hidden Gems stocks recommended in 2017 is 12.6% compared to small cap index average returns of 8.3%. As on date, Hidden Gems stocks are outperforming small cap index by 4.3%. 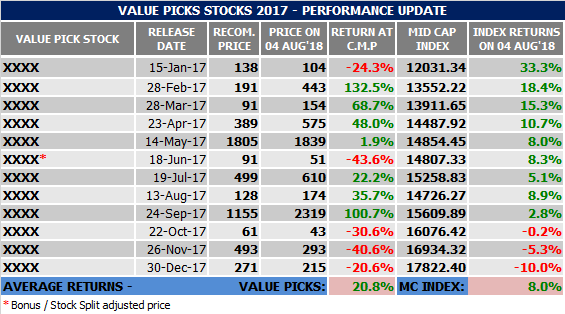 Our Value Picks stocks of 2017 also outperformed Mid Cap Index. 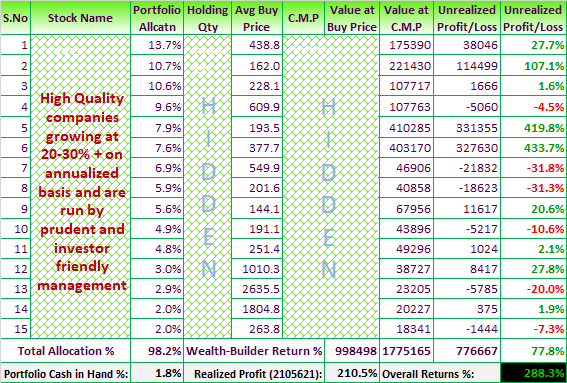 Average returns (as on date) of our Value Picks stocks is 20.8% compared to average returns of 8% of mid cap index, out-performance of 12.8%. Below table indicates subscription services and discounted prices valid up to 10th Aug'18. Simply click on SUBSCRIBE! link to subscribe to our services online using debit / credit card or net banking facility.